Fantastic Beasts Niffler Felt Coin Purse DIY with Hobby Lobby Giveaway! The next epic of the Harry Potter empire, Fantastic Beasts: Crimes of Grindelwald is on it's way to theaters...on November 16th. I love Harry Potter and the amazing adventure book series...and Fantastic Beasts is fun, not as in depth, but still fun. This week is everything Fantastic Beasts on my blog--Starting with this fun Niffler coin purse! This little guy can pack away a lot of change...plus stick around for a Hobby Lobby Giveaway at the end of the post. 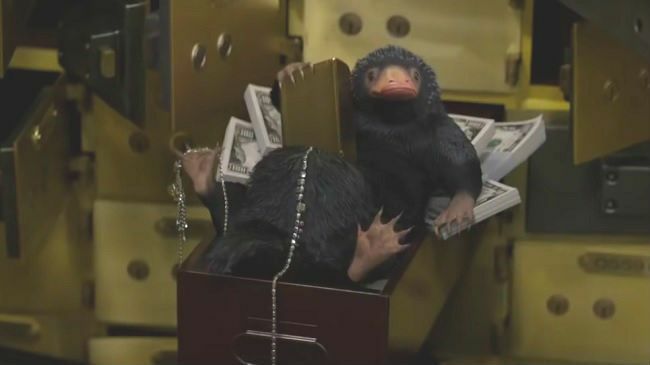 A Niffler is an adorable platypus-like creature that steals money, jewels and other valuables. Guess what though...they are real! A baby Echidna is called a Puggle...and it's adorable and looks just like a Niffler! I love it! So let's make a Niffler coin purse with felt! This project is cheap! You just need 2 pieces of brown felt from Hobby Lobby. The felt sheets are 25-33 cents each. I love their brightly colored felt too...I spent $8 on felt. Download the Hobby Lobby app and use a 40% coupon! You will also need a short zipper, scissors and hot glue/gun. Cut 2 pieces of 2.5 inches by 5 inches of dark brown felt. Use the hot glue gun to hot glue the felt on the zipper, not too close to the center or it won't unzip. Glue down both sides and then slide the zipper to the center. Place the zipper felt on top of another piece of brown felt of the same size. Cut out a large egg shape about 3.5 inches across, keeping the zipper right in the center. Cut through the zipper and all. Use the light brown felt and cut 4 little feet and a face. I just free-handed this and kept it super simple. Carefully life the top layer and hot glue in the little feet. Then hot glue around the entire niffler body and press the top down firmly. This will hot glue the ends of the zippers, so the slide doesn't come off. It looks kind of like a little brown turtle. I debated on which side to glue the face...so the zipper was the belly, like the movie...? But I decided to keep the zipper on the top so it would have more visual interest, since my zipper is cute. Then glue on the face and add little black or dark brown felt dots for eyes. Remarkably, this little niffler holds a lot of change without feeling big and bulky...much like the actual Fantastic Beast niffler! Win! Perfect holiday gift for a Harry Potter geek! I would buy paint, paper and other art supplies. Probably I would get a variety of craft and sewing notions, maybe embroidery supplies. I would buy paper, Paint, wax melts if they have them ect.. I would probably buy a cartful of yarn! That coin purse is absolutely adorable! I love that it's no sew, too. Pinning to my Harry Potter board. So cute. Thanks for the giveaway. I have about a dozen projects that need zippers. So I would start with zippers. Sewing machine needles & other hoo-dahs, doo-dads, & whatcha macallits that bling a project. Lol. Oh, what wouldn't I buy?! It's soo hard to decide! Maybe some vinyl, We R Memory Keepers items and also supplies for future Pinterest parties. I would buy more vinyl to make more geeky shirts! I would probably buy some Christmas Decorations and some stickers for my new journal. My son and daughter would love drawing supplies and crafting supplies. I would buy stamping supplies. I would buy the items needed to create beautful containers for my diy spa gifts! I'd buy Christmas decorations and picture frames!!! It's Hobby Lobby, what wouldn't I buy. LOL. I would probably buy silhouette blades and mats. Maybe some fun beads, glass blocks or wood projects. I would buy some new ornaments for the tree, and fabric and sewing supplies and beads and jewelry supplies, probably paint and art supplies too and one more frame for convention art we got in the summer! Love shopping at Hobby Lobby!